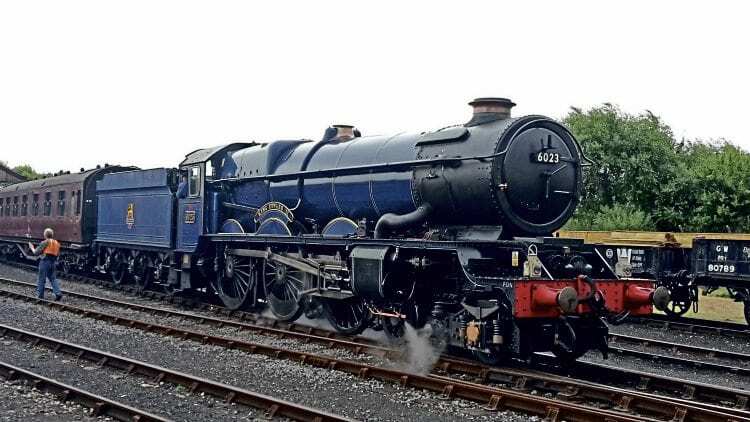 DIDCOT’S blue Collett 4-6-0 No. 6023 King Edward II could return to the network in early May. This will be the first time in five years that a Great Western ‘King’ has graced the main line, and almost 60 since the bark of a single-chimney example was heard in full cry. The Great Western Society is aiming to have the ex-Barry ‘King’ available to work two legs of the Railway Touring Company’s nine-day ‘Great Britain X’ railtour that kicks off April 29. The loco is currently scheduled to haul the Bristol to Plymouth leg on May 6 (with No. 34052 Lord Dowding), which precedes a (hopefully) triumphant return to Paddington the next day when the ‘King’ works the ‘GBX’ from Falmouth. Whether the cut-down ‘King’ meets this target will be largely dependent on its trials, which are expected to begin next month at the West Somerset Railway. The purpose of the visit to the Minehead branch will be primarily to test the new four-jet blast pipe under load, which cannot be effectively achieved on Didcot’s short demonstration line. If all is successful, the plan is that the ‘King’ then works its loaded main line test run from the WSR back to Didcot. The main line return of the ‘King’ has been a long time coming for the GWS, occuring six years after the loco first returned to steam following its ‘Mission Impossible’ restoration led by Dennis Howells. side-lined it after just 1,500 miles during its running-in trials at the Mid-Norfolk Railway in 2011, and after repairs at Loughborough in 2012/13 and further tests it has been confined to Didcot. Here, it has had its reduced height cab roof, whistles, safety valve bonnets and chimney fitted, together with OTMR/TPWS apparatus and a portable GSM-R radio, along with the new blastpipe.